The future of Deck Building Games has arrived with Legendary: A Marvel Deck Building Game. Legendary is the first Deck Building game of its kind where the game actually fights back against the players. For the first time Legendary will give players a chance to recruit heroes, featuring never before seen original art, such as Iron Man, Wolverine and Spider-Man to defeat villains, Masterminds and their evil schemes. 1-5 players can play cooperatively or competitively to determine the ultimate victor. An excellent co-operative deck building game. Each player starts with a basic hand of S.H.I.E.L.D. Cards and with these you recruit heroes from the Helicarrier. Each game sees a group of heroes face off against against a random Mastermind. Each mastermind will have a randomly chosen scheme they are trying to achieve and the heroes must try and build a powerful team before either the mastermind succeeds or time runs out. The set up for the game can be quite long as the mastermind, scheme, heroes, and the exact make-up of the villain deck are randomly chosen. This random nature is also the games strength as no two games are the same and players will need to work together to make sure everyone gets the cards they need while simultaneously trying to deal with the steady stream of lower-level villains that keep appearing in the city. An absolute must for Marvel fans, and those who like co-op deck building games. 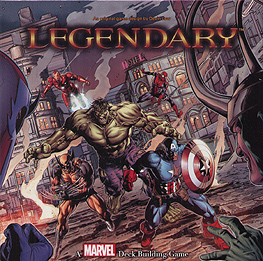 Marvel Legendary is a co-operative deck building game. The box is massive and provides a clear message that further expansions are planned due to the empty slots provided. Noted the game initially is time consuming to put together but we set up decks for both the heroes and villains thus cutting the set-up time down considerably. The art work is good however the pictures are the same; I know this has been rectified in the next expansion. The board is large and what is really handy is they have added two boxes in the top corners one advising on set-up and the other on player actions each turn (saves having to refer to the rulebook). The aim is to beat the Mastermind if you can using your hero's (sounds easy) well some are but it really is a combination of luck in terms of which heroes, villains, mastermind and scheme you are up against. What I do like about this game is the freedom to ramp it up if you think Loki isn't a challenge well you can add some strength to him!! Overall, Mr EvilSoupdragon and I are well impressed - not sure it would cater to everyone's tastes but it really is fun and addictive - if you like marvel you will definitely like this.